Forever a student – and that’s what makes it Wonderful! Phil’s question was innocuous enough; friendly chit chat as he helped pack my groceries. “Yes, we’re off to the Peak District. By the way, you should come to my Yoga class next Tuesday. Might help with the flexibility. I’ve got a couple of runners who seem to benefit,” he suggested as he swiped my loyalty card. “Yoga? Hmm. Maybe.” My reply must have sounded sceptical and images of purple rinses and pink leotards were doing little to help. But feeling the tightness in my calves as I reached to put the grocery bags in the boot of my car, got me thinking. I might just give it a go. By 8.45pm on Tuesday evening, I was destroyed. After Phil’s diplomatic but nonetheless embarrassing suggestion that I remove my trainers, I settled in to what I thought would be a breeze. After all, I was training for an ultra-marathon at the time. OK, I was a yoga virgin, but really, how demanding could this be? Very, as it turns out. Though this was a “gentle” class, my hamstrings were screaming after years of pounding pavements. On Wednesday (and for much of Thursday) I paid dearly. 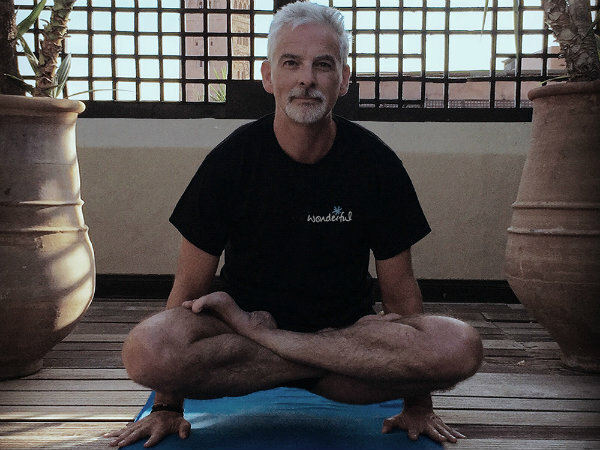 But the following week I was back for more and after six weeks – stupidly – I’d booked myself on to a Yoga Manchester Weekend Workshop with Ashtanga teacher to the stars, Danny Paradise. Though it was a baptism of fire, I loved that weekend. It was the second of my yoga epiphanies. I asked ridiculous questions, could manage only the vaguest approximations of the asanas but everybody was wonderful; welcoming, supportive, encouraging. And I’ve never looked back – well, at least not with a stiff neck. Since Phil’s suggestion at the supermarket checkout six years ago, my practice has been pretty consistent. Sometimes five times a week. Not always. But I love the discipline. The seeming opposites of pure focus and escape bring me back to the mat regularly. Primary Series really is a moving meditation. Late last year, inspired by Matt Ryan, my teacher at Yoga Manchester for several years; and also Phil, who introduced the world’s most reluctant yogi to his mat, I decided it was time to share a little of this practice with others. I’ll be starting my teacher training in a few weeks. I’ve reached a time in my life where I’m very keen to give something back, so my plan – once qualified – is to teach yoga exclusively for the Wonderful Organisation – www.wonderful.org – a non-profit we launch today (which also happens to be my 50th birthday). Though I hope to pass on a little of what I have picked up along the way, the most important lesson yoga has taught me is that you never stop learning. If you have a moment,please take a look at the Wonderful website. If you can, share your skills. Maybe you’re a yoga teacher too. Maybe you teach piano, walk dogs, work in a health spa, or garden. Perhaps you’re a bookkeeper or work in PR. It doesn’t matter. Get involved. The Wonderful Organisation is up and running. But it’s a new site so it’s over to you to fill its database with wonderful services – all supporting the tremendous work of our charities! Kieron's introduction to yoga was at the checkout in Waitrose. Not because he stumbled and found himself unexpectedly in Marichyasana B (wouldn’t that be nice? ), but because the guy he was chatting to on the till taught at the local community centre. After a baptism of fire when he realised the distance to his toes was far greater than he’d anticipated he began a regular practice. Six years on and he is soon to commence a Teacher Training course. Off the mat, Kieron is involved in a couple of businesses including the recently founded non-profit, the Wonderful Organisation. He enjoys producing music - mainly deep house - and has several releases under his belt under the moniker Soul Academy, including original tracks and remixes for other house producers and artists. A month with my teacher by Matt Ryan.